What's Wrong With A Messy Desk? Every day more and more information is thrown at you. New mail, reports from various committees, invoices, proposals, and more all hit your desk several times a day. You are too busy to deal with it right away so it just begins to pile up. Your desktop begins to look like a war zone. The problem here is not that your desk is messy; the problem is that important stuff gets lost. It either gets buried by new material coming in, or it's in the new material but is not noticed. As a result, you spend too much time on things that are simply urgent rather than those that are important. When your boss wants to know how soon she can have that report for the Vice President, you don't want to tell her you didn't notice the memo she sent you requesting the report. Nor will your boss be thrilled to hear that the layout for the new product line is late because you set it aside and it got covered up and you forgot about it. Some people will tell you the best way to solve this problem is a clean desk. Others say a mess is okay. Who's right? 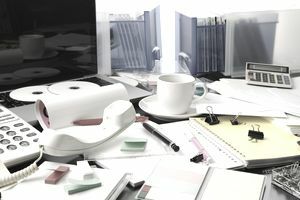 Not too long ago, there was a popular expression 'a cluttered desk is a sign of a cluttered mind.' That expression gave rise to an entire industry designed to help business executives clean their desktops as a sign of their mental acuity. No doubt you have seen movies where the boss sits in his office atop a downtown skyscraper. He sits behind a glass-top desk with no drawers. The only adornments are the impressive pen set for signing important documents and a telephone or intercom so he can give orders. We all know someone whose desk is that way. You don't see how they can even tell if the desktop is metal or wood. Yet, when you ask them for something, they go right to a pile, leaf through 2 or 3 sheets, and pull out what you asked for. Both sides are correct. The issue is not which is correct. The issue is which will make you more effective. There are a few fundamental guidelines that apply to both approaches, but the key is to work in a manner that allows you to be most effective. Almost everyone needs to get rid of some of the clutter atop their desk, but having no more than a single item on your desk at any one time won't work for many of us. Many people are working on several projects at the same time (or almost the same time). Creative types feel the need to have inspiration surrounding them. Detail-oriented individuals need volumes of reference material close at hand. Some people feel the piles of work make them look busy and, thus, keep them safer in times of layoffs. Others feel a clean desk shows how efficient they are at getting the work done. What is important is to do what works for you. Really Want to Improve: We don't recommend the severe approach that some do. Unfortunately, that leaves excuses to be too easy on yourself. This attempt to make your desk less cluttered and more efficient depends on you making a serious effort. Keep, Toss, or Move: Find three containers. Label the smallest "keep". Label the largest "toss". Have another container labeled "move." The really vital stuff will go into your keep container to be sorted later. Anything that you want to take home or give away goes into the "move" container. Everything else goes into the toss container. Start With the Oldest: You can tell by looking at them which pile is the oldest. Usually, it is farthest from your chair. It will be easiest to throw away items from this pile. Evaluate Each Piece Only Once: Look at each item in the pile. Decide which container it will go into. You can't set it back on your desk for later, you have to decide now. Put everything into one of the three containers. There is no other option. Ask Yourself This: The first question is "do I have this somewhere else, or can I get it from someone?" If you have a copy in your email, or in a report, or on the desk of the person who prepared the market analysis, etc., you don't need to keep another copy. Toss it. Then ask "why do I need this?" If the answer is a) to take action on it, b) to do something with it when I get more information from someone, or c) to refer to as I do other work, put it into the keep pile. (After you get rid of the clutter you will re-sort your keep pile by those three categories, so feel free to separate them now. It will save time later.) If your answer was anything else, toss that item. Be Ruthless and Brave: As you progress through each pile, getting closer and close to the things that just arrived, be ruthless in your decisions. Take no prisoners. If you really don't need it, toss it. And be brave. Don't hang on to something just because someone might ask you something about it someday. Don't build a fortress of paper to protect yourself. Your desktop doesn't have to be sterile and completely devoid of paper, although it can be if that helps. Your goal is to organize your desktop so that it maximizes your efficiency. If that means a few more piles on your desk than the person next door, that is okay - provided everything you kept helps you meet your goal of increased efficiency. What's the Difference Between Vision, Strategy and Tactic?